Producers: Shane Carruth, Casey Gooden, Ben LeClair. Amy Seimetz, Shane Carruth, Andrew Sensenig, Thiago Martins. Kris (Seimetz) is a successful professional who is targeted one night by a man who drugs her so she draws out her life-savings to give to him. When she has recovered, she finds she has lost her job and everything else and must start piecing her life back together. She meets a man (Carruth) who has also been subjected to a similar incident – together, they embark on a journey through their skewed realities as they seek to find themselves and locate their attacker for revenge. Director Steven Soderbergh called one-man creepy-sci-fi/thriller maestro Carruth the ‘illegitimate offspring of David Lynch and James Cameron’, as accurate and succinct a description as could be given to him. A former developer of flight simulation software with a gift for maths, he had to take the starring role in his first film Primer (2004) as his algebraic dialogue proved impenetrable for the actors he auditioned for the lead. This, his second and so far only other feature film, is the trippy stuff of over-medicated psychoactive nightmares, the horror coming not so much from the physical attack launched on Kris (a weird violation using the larvae of a particular plant) but from the fevered, disjointed journey she undertakes to piece together the scrambled jigsaw puzzle of not just her memory but her entire self. Carruth uses some stunning editing and construction throughout to convey this, as the recently married couple stitch together the memory of their past lives in a single conversation that takes place in multiple locations at different times, cleverly furthering the plot on as they move out of their house and nearer to their attacker. The only downside to the film is that Carruth has inserted such pointless oddness into the narrative when his style of film-making, camera angles and script writing were already enough to smartly tell a strange and haunting story. The larvae/mind-control were one thing, but the transplantation of it into pig-hosts that act as a life-link for the human victims (infertile Kris becomes a mother at the end to an adorable little piglet) is a step too far and, for this reviewer at least, stretched the limits of disbelief to breaking point. A little ponderous to start with (I was stunned by the theatrical trailer), I felt agitated by the film’s slow and annoyingly prosaic opening third and what seemed like a mad trip to nowheresville. 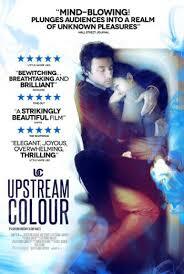 But as the flotsam and jetsam of the characters lives are ingeniously cobbled together, Upstream Colour reveals itself to be a poetic, elliptical journey as lost minds struggle for sense, reason and fulfilment in a supposedly sane world, which to some degree is what all of us go through at one point or another. But without so many pigs.